Hatters midfielder Andrew Shinnie’s performances this season have drawn the highest praise from striker Danny Hylton. The Scottish international produced another excellent display during Saturday’s 2-0 win over Rochdale, as he has now begun every single game of Luton's 22-match unbeaten record. That makes it 29 starts in the league this term already for Shinnie, compared to just 24 last season, where he only managed to play five consecutively from the first whistle. 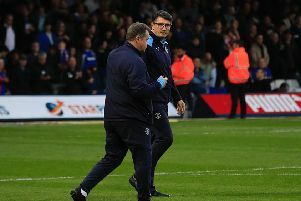 The ex-Birmingham and Huddersfield player's goalscoring threat has increased as well, scoring four times in League One, whereas he managed just one in League Two, as Hylton said: “It’s scary to think at times last season he wasn’t even making the bench for us. “In my opinion, we’ve got individuals that have been unbelievable this season, but Andrew Shinnie for me has been the best player by a million miles. “Every single game he gets on the ball, he’s unplayable at times. He works so hard, he’s never injured, his performances have been fantastic, it’s just a joy to play with Shinnie.